I tweeted earlier about the summary of the Austrian avalanches in the 12/13 season, on the blog of Franz Trimmel, a mountain guide and avalanche training expert based in St Anton. The one incident that stands out as being of the most interest, in my mind, is incident 7. On the 4th of February 2013, next to Piste no 3 below the Hexenboden lift in Zürs, a local skier from Vorarlberg was skiing off to the side of the piste. This is something I’m sure many of us do, seeking fresh tracks just the other side of the piste markers. Visibility was poor and he, unfortunately, triggered a small slab avalanche and got buried head first. The snow in these sorts of slides can set very hard and very fast, and it’s unlikely anyone would be able to dig their way out, especially when upside down and undoubtedly panicked. He was less that 10m from the piste but despite his legs being visible above the avalanche debris he was not seen, probably due to the poor visibility. Mountain rescue eventually found him but he could not be revived. 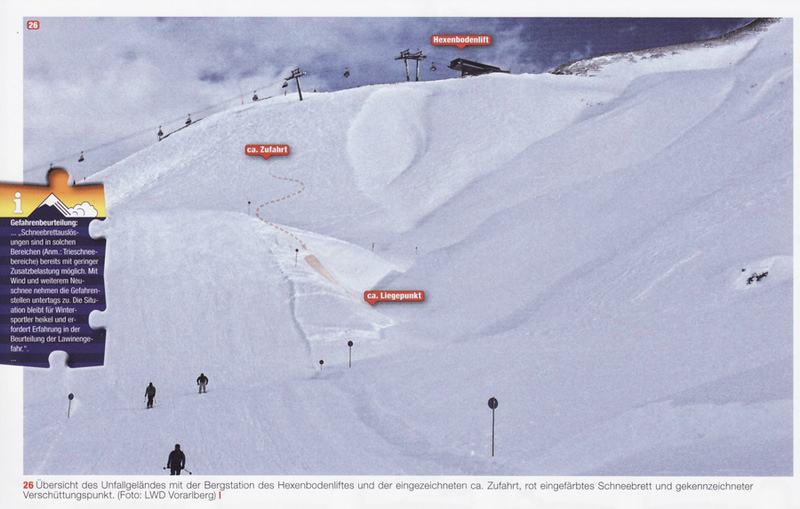 It’s unfortunate that such a minor slide in such close proximity to the piste could have such consequences, but it’s a reminder that we need to remain vigilant and always consider the risks, especially in poor weather conditions. I’m sometimes asked what constitutes ‘off piste’. I think this incident can only serve to demonstrate that as soon as you’re off the piste you are, indeed, off-piste. Content image from Franz Trimmel’s article. Such a sad outcome and that close to the piste area. It just shows how you have to be alert at all times.